Jean and David Leader have just released what they believe to be the first lace iPhone app of its kind (yes, it really is the first! ), appropriately entitled “Lace”. 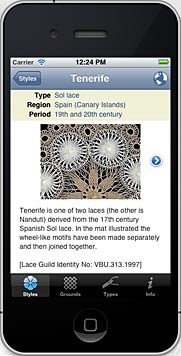 The Lace app is designed to provide a quick reference to about 60 individual styles of lace (Bedfordshire, Gros Point, Tenerife etc.). For each entry there is a short explanation of the distinguishing features of the lace type, including its region of origin (available on a map) and historic period. This is illustrated by a detail from a piece of the lace and one can also see a full-screen view of a whole (or larger) piece of lace. Most of the lace illustrated is from the collection of the British Lace Guild. Further information is on Jean Leader’s website at http://www.jeanleader.net/publications/lace-app.html. An iPad version is planned although preliminary feedback indicates it already works quite well on the iPad. This entry was posted in Original Research, Social Media. Bookmark the permalink.